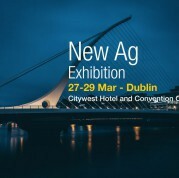 Visit Tradecorp at the New Ag exhibition in Dublin, Ireland. Stop by from the 27th-29th of March, located at the Citywest Hotel and Convention Center. At the annual New Ag exhibition, Tradecorp will have an interactive stand hosted by directors and members of the technical and sales force team. Making this an excellent opportunity to gain receive personalized advice for your crops. In addition, Camila Levy, R&D Agronomical Manager at Tradecorp, will be giving a speech about the innovative solutions for crop nutrition involving foliar application. Having worked as Tradecorp’s Agronomical Manager for over four years. With a Master’s degree in Project Management as well as a Master in Tropical Agriculture, Camila is an experienced professional in her field. She holds over twelve years of experience in the Research and Development sector.